Who Says Hours-of-Service Compliance Has to be Difficult? Almost everyone in today’s society seems to have a smartphone or tablet device. In fact, a new study by the PEW Research Centre shows that over 90% of American adults own a cell phone, and that these devices are used for much more than just making phone calls. Companies are constantly developing apps to better capitalize on the ubiquity of mobile devices. People continue to demand more and more from their technology – both in and out of the workplace. It is important for telematics providers to meet the needs of their customers and end-users. 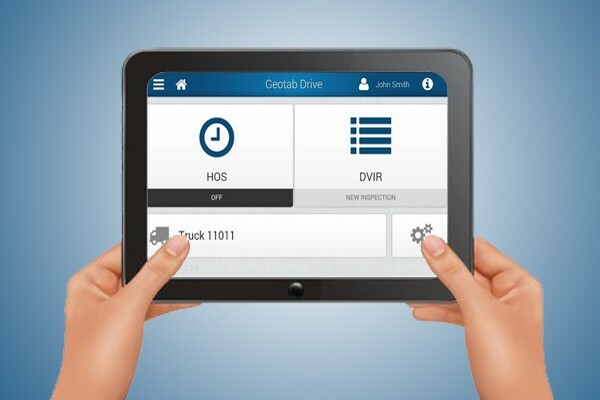 Geotab Drive – a recently developed app, which can be downloaded on Google’s PlayStore, has a multitude of features – including hours-of-service (HOS). This app is intended to comply with the DOT regulation needs of Truck companies, specifically in the USA. Compatability Geotab Drive is compatible with devices running Android 4.1 or higher. Preferably with a 7-inch screen and capactive touch screen. The device also must have a built in cellular modem (3G or LTE) and GP. FlexibilityEven if your dedicated HOS tablet were to stop working for whatever reason, the solution to the problem is as simple as pulling out another Android device with all the required specs and loading the Geotab Drive app on it. As long as you have a valid data connection, you can always login to sync with the server and instantly gain access to all your HOS and DVIR logs. You do not need to rely on a single device & you can easily switch from one device to another. CompliancyGoFleet certifies that the design of the HOS Solution has been sufficiently tested to meet the requirements of § 395.15 of 49 CFR Part 395 under the conditions it will be used. Learn more about GoFleet’s HOS Compliance Solution here: HOS Compliance Solution & HOS Compliance Made Easy! or Contact Us!